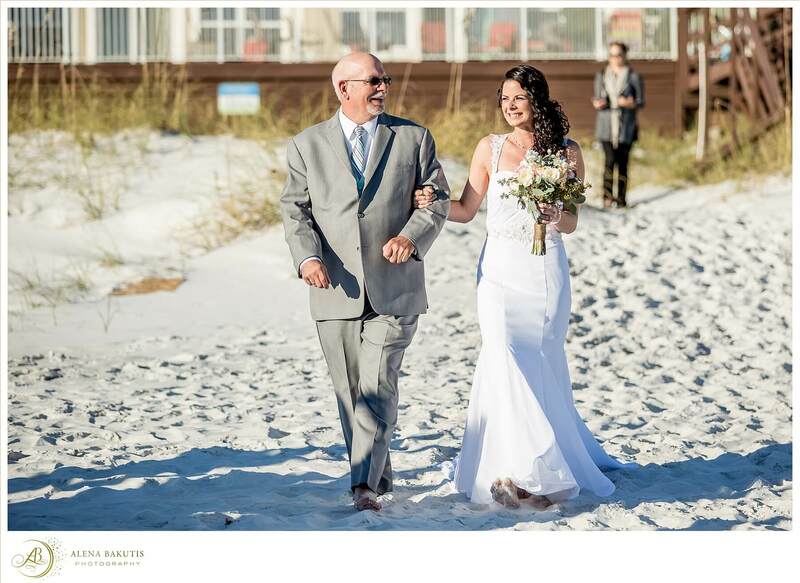 Brandon and Amber hosted a picture perfect and amazingly fun Destin Beach Wedding and Yacht Reception in October of 2017. They decided to conveniently stay at a beach house on Crystal Beach (right in between Destin and Sandestin) and held their destination Florida beach wedding steps away. Guests stayed at nearby Crystal Beach accommodations. Our wedding planners worked closely with the couple to ensure their accommodations were set as well as designing all the wedding flowers, decor and rentals for the beach wedding and reception, entertainment, catering and much more. Brandon and Amber chose a coastal beach theme for their Florida destination wedding, complete with beach themed centerpieces and soft pastel roses, all designed by our wedding planners. Sugar white, soft sand and emerald green waters were the setting for their nuptials which were performed by the captain of the SOLARIS Yacht. The romantic ceremony included laughs and tears of joy as Brandon and Amber said I Do and sealed their vows with a kiss. After a fun beach photo session with Alena Bakutis Photography, the newlyweds and guests took the short drive to Sandestin for an unforgettable reception out on the open waters on the SOLARIS Yacht. The couple took stunning sunset pictures on the sky deck of the SOLARIS yacht while guests enjoyed cocktails and live music. The night was filled with fun, laughs and unforgettable memories of dancing, eating and cruising. The night was complete with a sparkler exit for Brandon and Amber and then a golf cart awaited them to whisk them away to their forever. Congrats to the Martorellos!